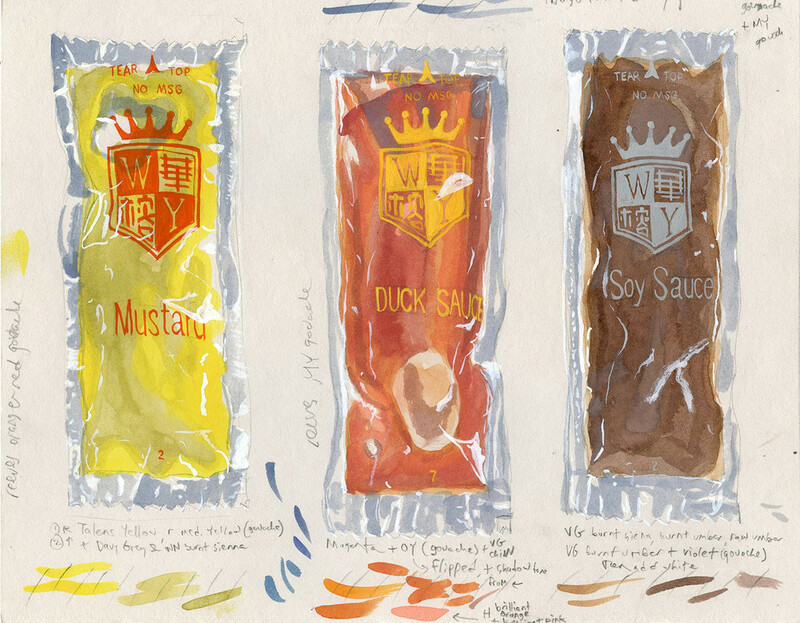 Watercolor and gouache painting of take-out sauce packets. Very recently I began making paintings of Chinese takeout packaging and containers. I get a lot of takeout at the studio, and the packaging is very interesting to me. Iconically symbolic of the omnipresent Chinese takeout places around the country, the designs are much more elegant and aesthetic than most takeout or fast food packaging and for things that are entirely meant to be disposable they have a very beautiful look to them. For this piece I used Stonehenge gray paper and painted the packets using watercolors and gouache. This one is 8" x 10", and is available as an original.